Here it is: Phil's Fish Market Cioppino recipe, also known as the best cioppino on the West Coast. 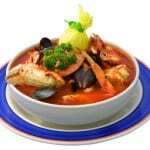 Phil’s Fish Market Cioppino Recipe: the best cioppino on the West Coast! This is the real, true Phil’s Fish Market cioppino recipe from Phil DiGirolamo himself. I visit Phil’s a few times a year, and this rich broth packed with fresh seafood never lets me down. We can easily call it “the best” since Phil’s Fish Market Cioppino recipe beat Bobby Flay in a cioppino showdown on Food Network, and he ships his fish-laden tomatoey broth to soup lovers around the world by the gallon. 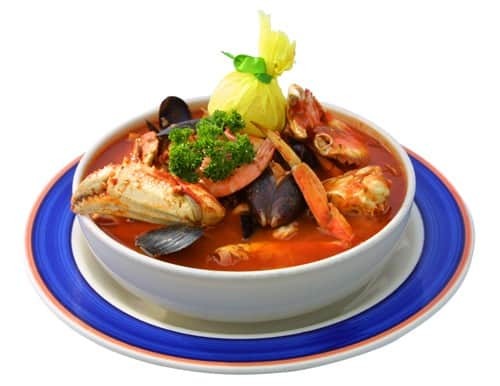 Phil packs his soup with clams, mussels, white fish, Dungeness crab, prawns, and scallops, so that’s what we’ve listed here, but you can use the base sauce and add any fish you choose. Remove it all from the shells for “lazy-man’s style” cioppino after cooking if you’d like, but the traditional soup is interactive – shells and all. You’ve got to try it, and if you’re ever in Moss Landing, CA – stop by to see Phil and tell him we sent you! Here it is: Phil's Fish Market cioppino recipe, also known as the best cioppino on the West Coast. Straight from the master himself, Phil DiGirolamo of Phil's Fish Market. Put the olive oil, butter, and garlic in a wide, deep pot over medium heat, and cook, stirring, until the garlic is fragrant, but not brown. Add the wine and the clams, and cover. Turn the heat up to medium-high and steam until the clams start to open, about 5 minutes. Add the mussels, cover and steam until the just start to open, about 2 minutes. Now stir in the cioppino sauce, the Worcestershire sauce and saffron and bring to a simmer. Add the cracked crabs, if using, and the shrimp, and simmer for about 5 minutes. Heat the olive oil in a large saucepan over medium heat. Add the onions and sauté until translucent. Add the garlic, bay leaves, parsley and basil and cook, stirring, just to warm the garlic—do not let it brown. Stir in the crushed tomatoes, tomato puree, water, clam base, brown sugar, celery salt, Worcestershire sauce, black and red peppers, cinnamon and salt to taste. Bring to boil, reduce heat to low-medium and simmer uncovered for about 1 hour and 15 minutes, stirring occasionally, until thickened. This entry was posted in Fabulous Fish Dishes, Featured, Main Dishes, Recipes, Soups and tagged celiac, dinner, g-free diet, G-Free Foodie, gluten free, gluten free cooking, gluten free food, gluten free holiday, gluten free holidy, kc cornwell, soup. Bookmark the permalink.